For aquarists younger than myself, the life and contributions of Jacques Cousteau may in fact not be on their radars. Even I, now rapidly approaching “middle age,” barely remember the PBS reruns of The Undersea World of Jacques Cousteau from my childhood. In fact, I’d argue some of us might be more familiar with the concept of Cousteau not from his own works, but from the spoof of Cousteau in the love-it-or-hate-it cult-classic Wes Anderson film The Life Aquatic with Steve Zissou (watch trailer). Owing to my own love of Wes Anderson’s work, when CORAL Magazine contributor Charles Delbeek shared this trailer from the forthcoming French film The Odyssey (L’odyssée), my heart leapt. 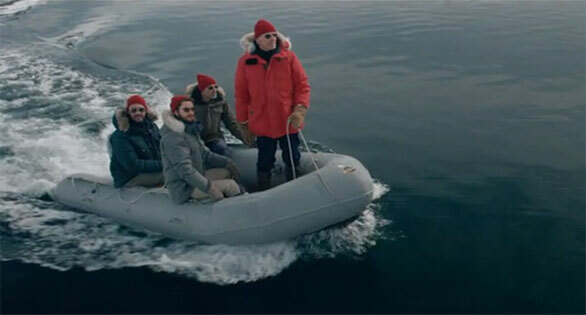 The moment I saw a a Zodiac containing 4 men in red caps skimming across a glass ocean surface, I knew this needs to be on my fall movie list. Screen capture from the forthcoming 2016 French Cousteau biopic, The Odyssey. Of course, watching this film may be an adventure in and of itself, first owing to the fact that it’s in French. Even if subtitles are an option, finding a venue to view the film could be a challenge. The French release is slated for October 12, 2016, and reports indicate that the film will also be released to the UK. But the Internet is not giving up any indications at this point that the film will see any sort of release in the US. If it does, I suspect it would be find showings in some of the smaller art-house type theaters in metropolitan areas. I can only hope. For now, I’ll simply have to let Seu Jorge’s David Bowie covers play in the background as I imagine what it would have been like to be Cousteau, to cross the globe exploring the waters of the world, with a signature red cap and a style all his own.